A South Florida holding center for imported research monkeys that had been the target of animal rights protests has shut down, with the company moving its operations to a remote location north of the Everglades. 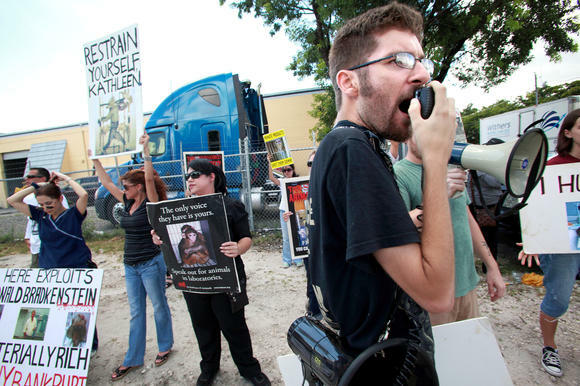 Primate Products Inc. has closed a fenced, cage-filled building near Miami International Airport that had been the focus of an animal rights campaign involving picketing, demonstrations against participating airlines and smuggled photos of bloody monkeys. The company has laid off 10 employees and moved its remaining operations to a complex near the Collier County town of Immokalee. Dr. Thomas Rowell, a veterinarian who is the company’s president, said the closure represented a long-planned consolidation that had nothing to do with the demonstrations. He said Primate Products had obtained federal permission to quarantine monkeys at its other facility and planned to reduce its import and sales business in favor of service and support. Gary Serignese, of Boca Raton, executive director of the animal rights group South Florida Smash HLS, said he doubted this explanation. During the campaign, activists held demonstrations at the Pembroke Pines home of the company’s previous president. Using email, phone calls and picketing, they pressured local freight airlines into refusing to carry primates. They obtained photos of injured monkeys from inside the facility and provided them to the news media. In arguing for the company to close, they said the monkeys were headed for lives of boredom, pain and fear, with dubious benefit to human health. Primate Products has said its work provides essential research subjects to scientists, who are the best judges of their biomedical value. “We are here to assure you and others that PPI is committed to our mission to serve the biomedical research community and to provide products and services specifically designed to enhance the conservation, care, and use of nonhuman primates for advancing public health,” Rowell wrote in an email. ……and best of all, you are going to get sued for all the costs associated with the move….so stand by and wait for tha process server.